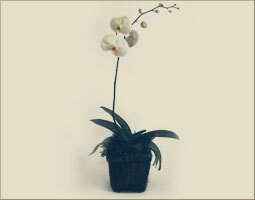 A Classic white Phaleanopsis orchid plant. We create beautiful orchid plant displays and white orchid arrangements with Phaleanopsis orchids. We guarantee prompt orchid plant gift delivery in Beverly Hills, West Hollywood, Santa Monica and greater Los Angeles area.